>Now, who could ever tire of ice-cream! Well, I am no big fan normally but this homemade strawberry one could give me a change of mind… Strawberries and cream in a soft, cool cup with the added bonus of Pimms… Even I can’t resist. I had a big bowl of it tonight with some fantastic butter biscuits baked by my youngest – more on this next time! Make the syrup then let it cool while you rinse the strawberries and cut off their tails. Blend all ingredients then put in an ice-cream maker or in the freezer, depending on your favourite method. I got my ice-cream maker as a wedding present and I have used it so frequently along those long years of wedded bliss that I would recommend the whole thing (marriage and all) wholeheartedly – worth keeping as well in case of divorce. 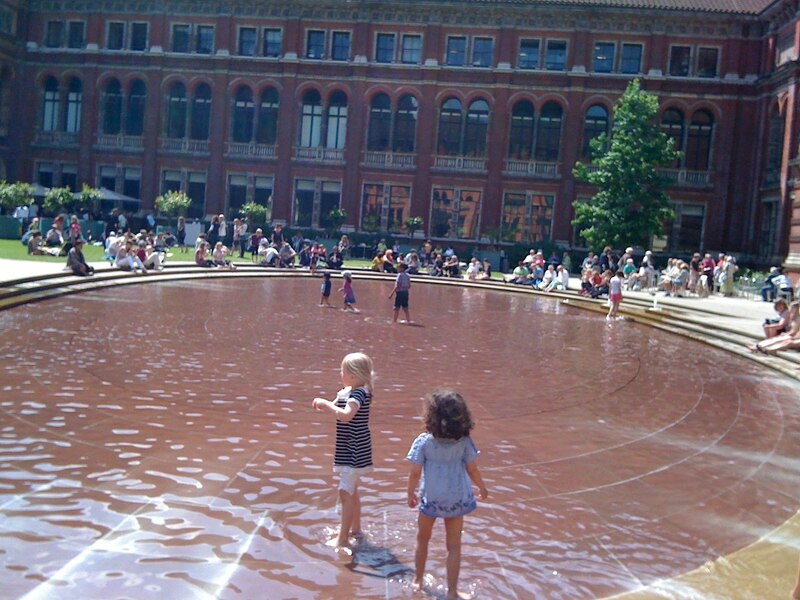 Perfect after a splash in the really cool new V&A paddling pool ! Go to the cafe for a nice cake and tea ; then catch up on your tanning in the lovely inner garden and let the kids splash about. Summer in London has its up sides. Re-reading the whole Adrian Mole series in conjunction with the children and laughing out loud at all the jokes certainly is another one! I had forgotten how funny the Secret Diary was. I first read it aged 18 and WHY did I not read the sequels I can hardly understand… No time to lose! Thanks for delayed planes and boring train journeys, we might actually go through the whole lot by the end of summer!! !